Our new hamburger range, ChefBurger, is made of 100% beef. National origin 100%. Premium quality 100%, given that only chuck and bavette meat is used in the process. We are 100% proud of our origin. 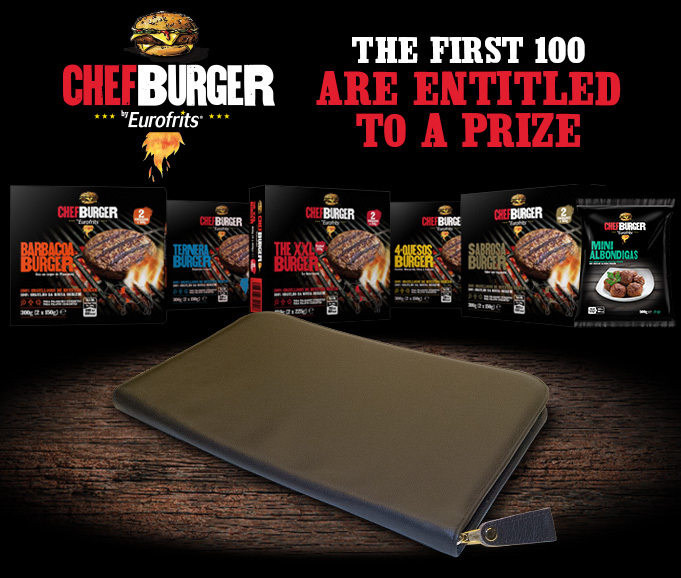 For all those reasons, the first 100 ChefBurger orders will be awarded a prize: a personalized document carrier. Do you want yours? All you have to do is order 152 boxes of the ChefBurger range (it may be from different references, but all in one order), that contains no added sulfites or colorants, and their cooking time is only slightly superior to refrigerated products, and with a use-by-date above one year. The ChefBurger range has 7 varieties: The XXL Burger (the Americana, with a weight of 225 g/unit), Ternera Burger, Sabrosa Burger, Barbacoa Burger, 4-Quesos Burger, Mini Burger and Mini Albóndigas. Be one of the first 100 to place an order of our brand new hamburgers and walk away with a prize!